The Taveta Golden Weaver was formally described by Richard Bowdler Sharpe, an English zoologist and ornithologist who worked as curator of the bird collection at the British Museum of natural history. The Taveta Golden Weaver was collected by HCV Hunter, an English zoologist and hunter who is better known for discovering and collecting the Critically Endangered antelope, the Hirola or "Hunter's antelope", in 1888 along the Tana River in Kenya. Hunter collected the Taveta Golden Weaver along the Useri River (Shelley 1905b) near Taveta. Hunter collected a large number of birds in the Mt Kilimanjaro area in June to August 1888. The collection was written up in 1889 by Shelley, who described several new species. However, he listed the weaver as an Eastern Golden Weaver and it was only in 1890 that Sharpe realised that Hunter's weaver was a new species. 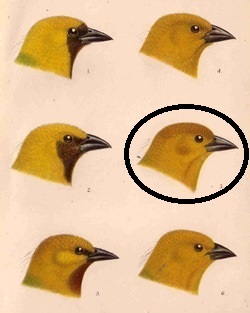 The first illustration of the Taveta Golden Weaver was of the head of the type specimen, published by Sharpe (1890) with the heads of similar species. The next illustration was of an adult male in Reichenow (1902), considered to be a new subspecies at the time. Hyphantornis castaneiceps	Sharpe 1890,	Cat. Birds. Brit. 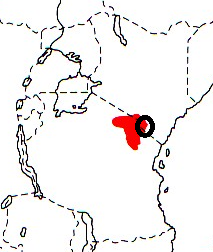 Mus., 13, p.448	Taveta, Kenya. castaneiceps, Latin: castaneus, chestnut-coloured; -ceps, capped, crowned. 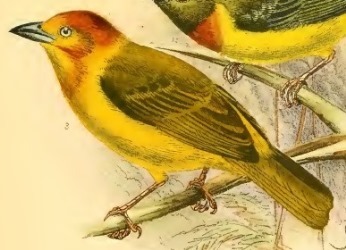 Rufous-crowned Golden Weaver (Shelley 1905b). Brown-naped Golden Weaver, Rufous-crowned Golden Weaver, Taveta Weaver. The type is in the Bristish Museum (BM 1889.3.21.71).